he unmistakable rattle of a makiwara board, part of the life sounds of an old Karate Dojo. Or Jiu Jitsu Dojo, as was our case at the old Hatashita Judo Club in Toronto, Canada. Crack!...crack!...crack! 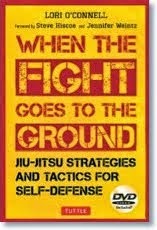 Because Shihan Forrester, the Father of Canadian Jiu Jitsu, merged atemi waza (striking techniques), the wooden plank, rising perpendicular from the edge of the mats, was a natural piece of equipment…an extension, so to speak, of the hours of punching and striking drills while moving stance up and down the floor. Ours reached the height of just under six feet. I can’t remember exactly but the base must have been about three inches thick, gradually tapering to the thickness of an inch or so at the top. A padded target was strapped around the board. I recall two prominent colours on its canvas surface: splotches of gray from abundant use mixed with stains the colour of rust (old and faded blood). 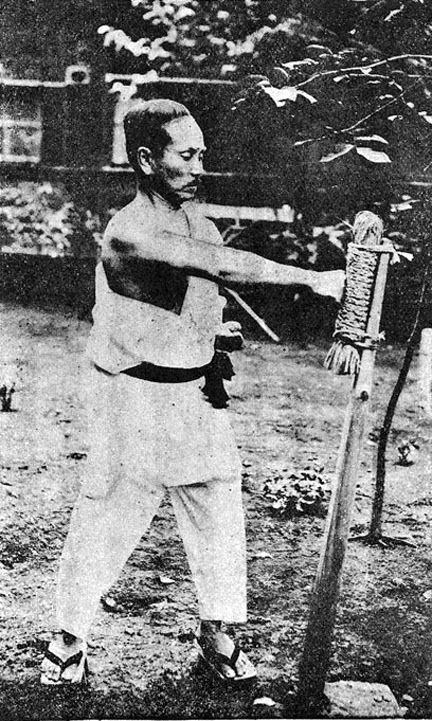 The more traditional makiwara boards were wrapped with rice straw (as in the example in the photo of Nishiyama Sensei) and bound to the board with rope. Boards found within Dojo were often supported at the base by ninety degree angles, screwed into both board and floor. 1. Safety: the striking arm wouldn’t reabsorb that much of the force on the rebound which might, if the technique was done incorrectly, lead to damage of the joints. A certain amount of bounce-back force might also travel back through the arm right up to the brain. 2. Penetration: the human body is made up of layers of muscle and bone. The punch or strike must pass through these layers in order to realize the old Karate goal of ikken hissatsu…one punch kill. Timing is important. The entire body has to be mobilized behind the strike to create such an extreme form of penetration. However, with poor timing and technique, the strike “bounces back” off the board. 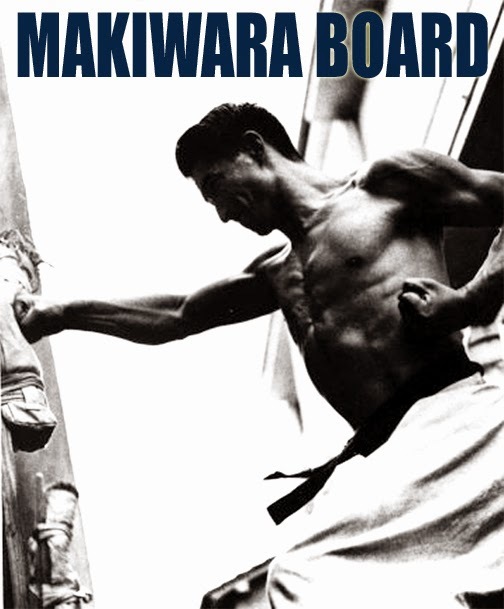 In this, and in many ways, the makiwara board acts as a teacher. It tells you when a technique is being done correctly and it shows you what must be done in order to improve. the body. In fact one of the first things other practitioners looked for on you were callouses on the knuckles of hand or on the sides of the feet. That meant you were training hard, and with serious intent. So, as a Karate-ka faces the board and starts to practise her reverse punch, she forges not just the body but her mind. The sound rattles on. Through hundreds of repetitions, she forges a will of iron. We used to practise our knife hands, back fists, elbow and other strikes against the board. 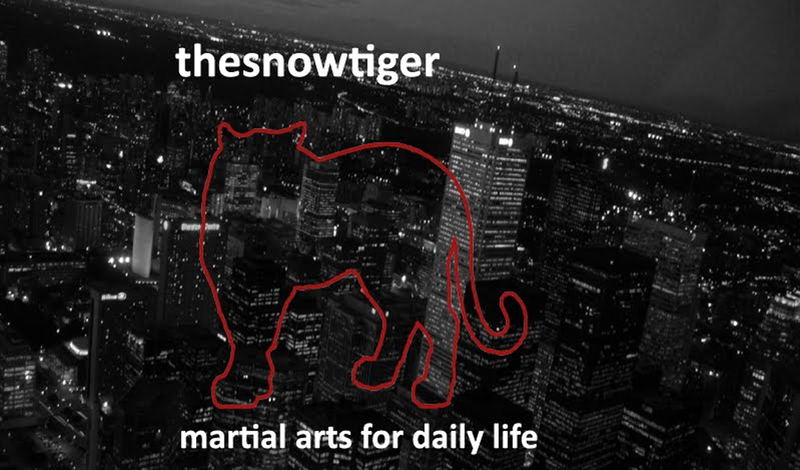 My Karate teacher, Sensei Monty Guest, told me that O-Sensei Tsuruoka (The Father of Canadian Karate) would, after a duration of striking the pad, tell them to strike the unpadded portion of the board…to the point of bleeding. Makiwara boards were also found on the exterior grounds of a Dojo. In those cases, they’d be planted deep in the ground and would still be tapered above ground to provide that necessary “give”. One thing I’m not quite sure of is whether other martial artists used healing ointments before and/or after using the makiwara. We didn’t. In Kung Fu, we definitely did use dit da jow ointment before and after striking gravel bags or sand bags. We also used Chi Kung exercises. It would be interesting to hear about your experiences. There was –and is – a certain symmetry of purpose behind having practitioners striking a bank of makiwara boards along one side of a Dojo. It recalls the days of the sword smiths. The sound of the forge prevails. It is, like the etiquette, the sounds of Kiai! and the Osu! and the sounds of dozens of bodies snapping out a technique all at once, part of the living pulse of a Dojo. Good day Mr Walther.....an excellent read. " exterior grounds of a dojo " ...as are mine. ....regards Jon. Thank you for your kind words. I just visited your blog. Nice work indeed, especially your recent article on giri.